Chuoi chien (Fried Banana) was our dessert for Easter lunch. Crispy on the outside but warm, sweet, and fragrant on the inside–it’s no wonder this is a really common street snack in Vietnam. Made from a variety of small and short bananas known as chuoi xiem (also chuoi su) in Vietnam, it’s also called bananito, mazana, or ladyfinger bananas and has a much sweeter taste and more fragrant smell than your common banana. When ripe, the peel actually turns black. But you’ll be mistaken to think that it’s rotten–these bananas are some of the sweetest and fragrant bananas you’ll ever taste.While buying our bananas, a 7.2 earthquake hit Baja California, hundreds of miles from LA, but I was totally oblivious to the grounds around me shaking and suddenly found myself the only one in the small fruit market with my bag of bananas as everyone ran out to the streets. Now you know the dangers we go through to put this post together. 16 oz can of coconut milk–of which save about 3 tbs for the batter. Peel and flatten with the banana with a smooth flat surface such as the side of a large knife or other flat surface. Prepare your batter in a large bowl by adding water and mix well until smooth. Add sugar, salt, and the 3 tbs of coconut milk. Heat the remainder of the coconut milk with the salt, sugar, and bring to simmer and stir frequently. Reduce by half to thick consistency and adjust sweetness to taste and set aside. Heat a pan or wok with frying oil. Test readiness of the oil by dropping a small droplet of batter–it should sizzle and rise to the top. Dredge the flattened bananas in the batter and fry until golden brown. Drain and serve immediately. Sprinkle the toasted sesame on the coconut dipping sauce and serve. This recipe is extremely versatile and you can easily add your own personal touches. Experiment with adding cinnamon, sesame, or shredded coconut to the batter. 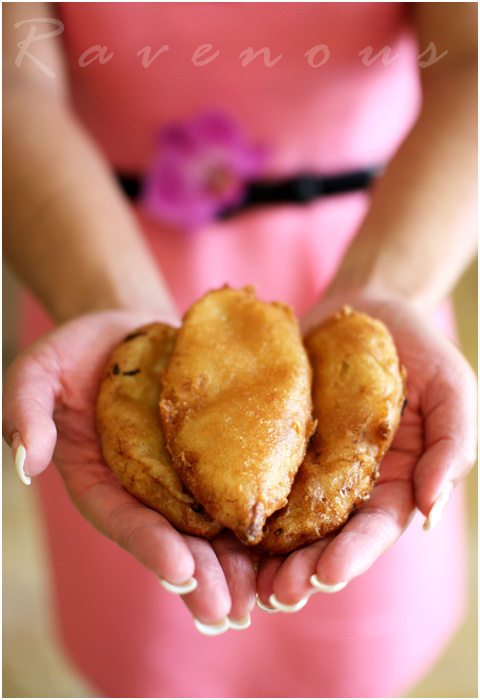 Hot, crispy, and delicious chuoi chien–our Sunday best, from our home to yours! Oh, I love this snack so much. I also tried some banana fritters here in Australia, but they are not good as those in Vietnam. Having read your recipe, I know why. They don't have any coconut milk incorporated into the batter. Hmmm…make a big difference in taste and smell. Christine: The coconut milk in the banana does add a nice flavor and smell to the batter..but overall, the quality of banana makes the most difference. Those fried bananas sound so good! I really like the before and after photos with the bananas being held out! Believe it or not, in the north, the small and cute bananas are called “Chuoi Ta^y” = western bananas. Not until I came to Australia did I know that the ‘western bananas’ are rare here :P.
I always wonder if that package of flour works. The Viet aunties @ my local shop swear by it! Those bananas are so cute! They are quite yummy! Kim, your dress is so cute – even though it's blurry in the background! 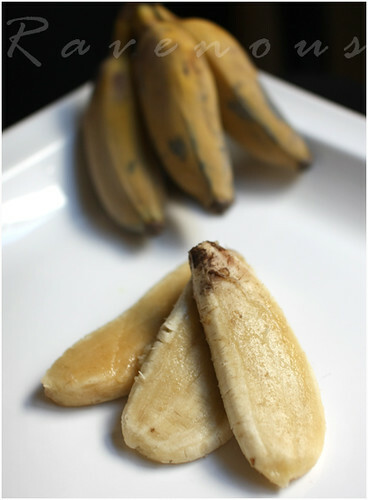 When our bananas get ripe in the backyard, we'll have to try chuoi chien, too. Yum! anh: we had to go to 2 different supermarkets in orange county to find these bananas but they were well worth it even if there was an earthquake during the search! fresh local and best: they're small and cute but they are filled with sweet flavors and aroma! Kim must have looked gorgeous in that dress. Gosh, I love your photography. 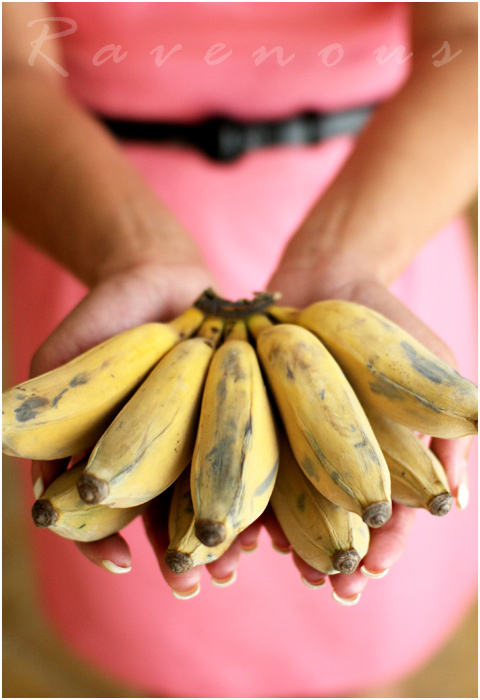 I KNOW these bananas … we give babies this variety when they start eating solids. 😉 I think your kitchen must have smelled heavenly! 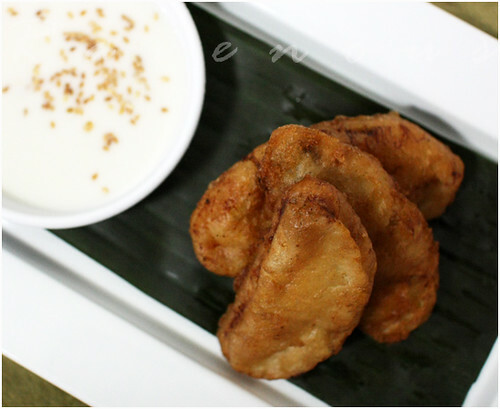 Fried bananas are just one of the best and anything with coconut is always welcome. Your photos are beautiful as always. 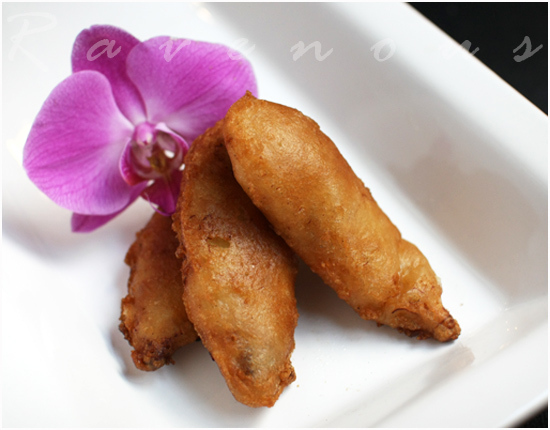 We call it Goreng Pisang (in malay) meaning Fried Bananas. I believe they use a different variety in Goreng Pisang but I am not sure now. Hmmmm…. Ju: She did! Great idea to use these as baby food..naturally sweet and delicious! tigerfish: thanks for letting us know! Wow, you guys felt the earthquake. Judging by these delicious photos it was definitely worth it. The chuoi chien looks great. I love chuoi su and I love how it becomes firm when cooked. 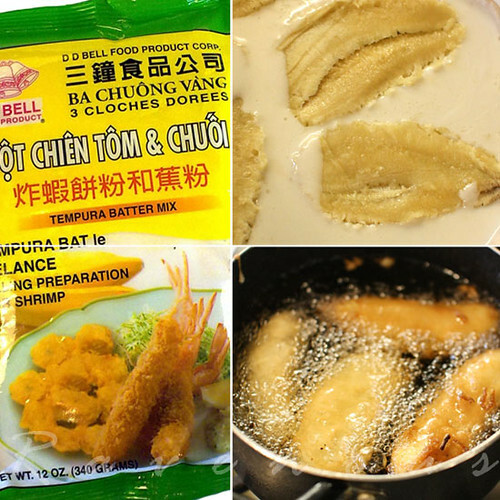 Great for making che chuoi. Of course, I will love your recipe because my grandmother loves banana. And this is another recipe that I would cook for her to taste. I'm sure she'll love it. Looking at your ingredients, this would not cost too much and that is my target, something great for something less. And mind you, Bananas are healthy, they're rich in potassium- it is time to regulate our blood pressure. These fried bananas look divine! Quite sometime didn't have fried bananas already!….tomorrow will get some! I love eating these when they are hot and crispy. Next time you make these I'll bring over some vanilla ice cream! 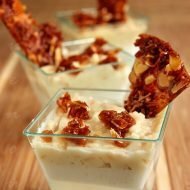 I love these desserts! I tried to make them with plantains but they never seem to come out right. Will definitely try this recipe. Thanks! Heehee, when I asked my mother-in-law how she makes her deep-fried bananas she pointed me to the same brand of deep-fry flour that you guys use! It must be authentic! Those smaller, intensely sweet bananas make all the difference. Luckily here in France you can find them at larger conventional supermarkets–hooray! I know what I'll be making when I get back from Barcelona…Thanks for posting this recipe! I love banana fritters. Agree with you that the type of bananas is very important. That's the type of bananas that we always use back home but sadly I can't get them here. 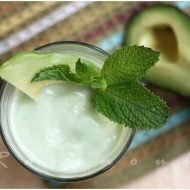 Thanks for braving the earthquake for this recipe! It's hard to find the ladyfinger bananas over here, but I'm going to hunt them down just to try this. Yen: It was worth it..can't wait for you to make che choui and post it! kathy: chuoi chien is definitely economical for sure! cajun chef ryan: thank you! Pete: glad we could tempt you with some chuoi chien! tripplescoops: now that's a deal!! vyvilyn: the flavor and fragrance is best with chuoi xiem/su so try to find those. steph: thats a good sign! but really, probably any brand would work–the right banana is key! greg: The coconut in the batter does help..we'll try even more next time. tammy: couldn't agree with you more–have fun in Barcelona! Yum! I absolutely have to try these! 5 star foodie: yes for sure! Where are some of the best Vietnamese markets here in LA? Would love to visit and poke around. We could try these for another one of our ethnic exploration posts! Oh, I love fried bananas of any kind and had no idea that they are part of Vietnamese cuisine as well! Can't wait to try this recipe. Fried bananas is my favorite thing when I go to Asian restaurants, especially the Vietnamese ones. I'm making Swedish cupcakes in the latest episode of my online cooking show, please check it out! I know I say this a lot, but mmmm, NGON QUA! I love anything fried, especially bananas. They look lovely! I've now made several rounds of Bo Kho, Bun Thit Nuong, and various buns for your recipes but this was the first dish that came out looking as good as it tasted. Thanks again! DuoDishes: The only one in LA that we know of is A Marketwarehouse in Silverlake. But whenever you guys want to check it out, let us know!! Ann: yup, they're really common as snack foods. Heidi: thank you! let us know if you do make it! Illusion of Doing: Thank you so much for the photo! We'll assume that the rest of the dishes at least still tasted good! We added the photo to our Facebook fanpage! Do send us more or join our FB page and add them! Kim's dress looks so cute (even though the picture is fuzzy)! Happy belated Easter! I just love the taste of chuoi chien! I used to eat them and banh cam all the time in orange county… too bad i moved. But now I know how to make them! Cam on Co & Chu! let us know how it goes on our facebook page! Easy to make, delicious in taste! Thanks so much for sharing!! it realy good every body need to try it. My mom never make dip to fried banana, but only to steamed banana.